This braces mouthguard provides our Gold level of protection for people with braces only on their lower teeth. With dual layer construction, this mouthguard offers great protection and fit. What is the Lower Braces Mouthguard? 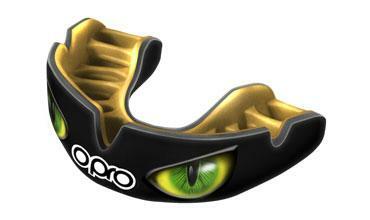 The OPRO Lower Braces Mouthguard is designed specifically for people with fixed braces on their bottom teeth. Ideal for any sport where a gum shield is needed, this mouthguard is great for anyone aged 10 and up. These braces gum shields have an anti-microbial additive, both in the mouthguard and its case. Rest assured your mouthguard is hygienic to wear, as this additive prevents 99.99% of bacterial growth. The fitting process is simple. This model has shorter fins than our regular models, plus our unique brace bumper, giving a comfortable, safe fit from the get-go.